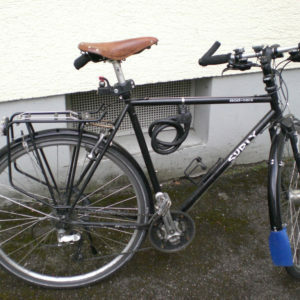 Due to a total failure of the old steel frame of my former “everyday” bicycle I bought a new frame in june 2005 – Surly Crosscheck – and built a new bicycle. It has horizontal dropouts with a hanger and a spacing of 132.5 mm – so it is possible to mount road hubs with 130 mm as well as “MTB” hubs or shifting hubs with 135 mm. Also wider tires or fenders and a rack is no problem. 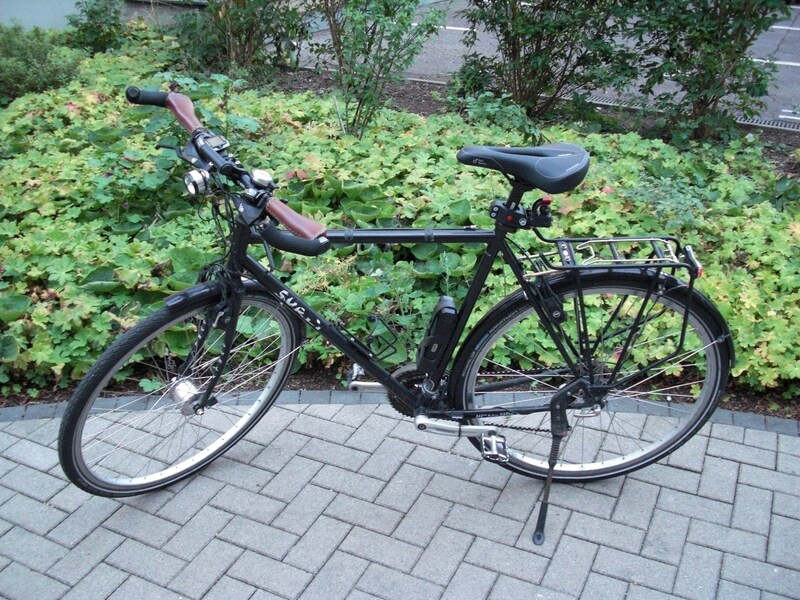 Originally I tried to use as many parts from the old bicycle as possible – but in the end it became an almost completely new assembly. 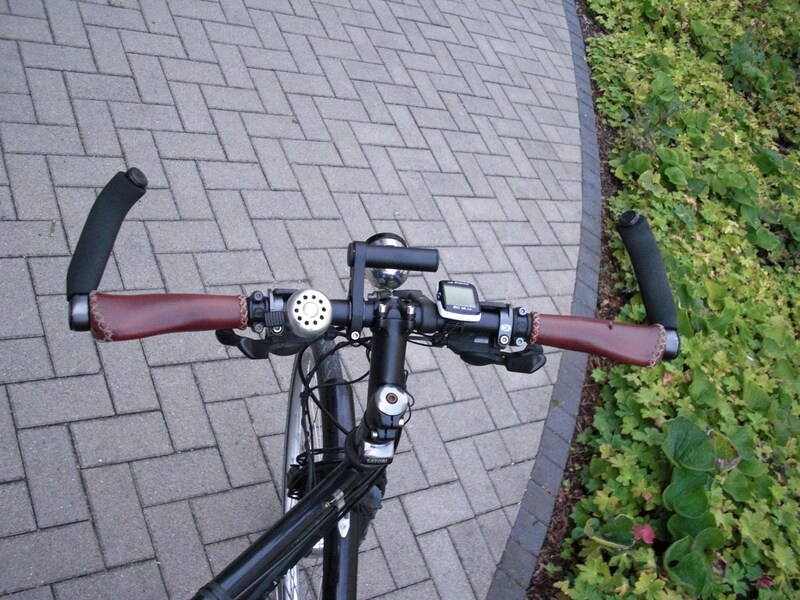 The new rear wheel was already planned for the old bicycle and was built by myself. 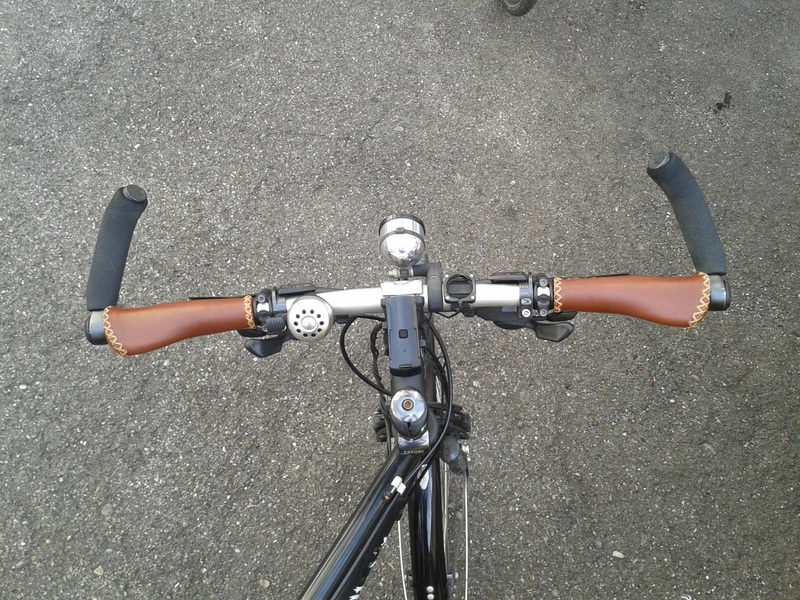 The following picture series shows the development over nearly 11 years: first build in September 2005, then in February 2015 and finally in July 2016 after the Brooks leather saddle was stolen :-(. The first step was sealing the frame tubes to avoid excessive rust development – which is also recommended by Surly by the way. For this I used “Caramba Hohlraumspray” for cars – a medium, which is sprayed into the tubes in liquid form and becomes a waxy coating after a few hours, when the solvent volatilised. Headset and fork were mounted by the dealer, where I bought the rest of the parts. 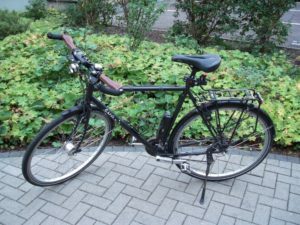 The rest was assembled during about three weeks little by little – in a proper workshop it probably would have been faster, but I bought a cheap used bicycle for the transitional period, which was reasonably useful and afterwards served my brother for a couple of years quite well. Due to the frame geometry there is only little space between the rear fender and the seatpost. First the front derailleur didn’t fit at all. A “down swing” model, where I thought, that it would be less problematic, unfortunately also didn’t help. 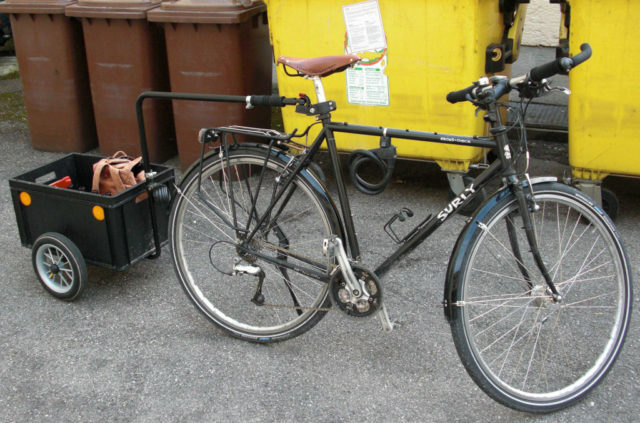 It would have worked without fender – but for a “everyday” bicycle this was not the ideal solution. So the only possibility in the end was to move the fender a bit back from the lower crossbrace using a spacer. In this way, it was possible to mount the front derailleur and the rear wheel still fits – even when it’s quite tight with an inflated tire. The Nexave rear derailleur from the old bicycle with the reverse attachement of the spring turned out to be quite problematic – the combination of the cable routing below the bottom bracket and the tight bend of the rear cable housing caused problems when changing gears. It was not possible to adjust the cable in a way, that both directions worked properly. 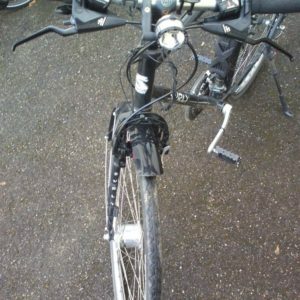 After several trials a derailleur with “normal” function was mounted, which works reliable. For the sprockets an 8-speed-cassette is used, which still works with “7-speed”-chains, which I assume to be a bit more durable as the narrower versions for 9- or 10-speed-gears. Fortunately the cassette hub gives the freedom of choice – if I once want to use smaller gear steps I can change the sprockets very easily. 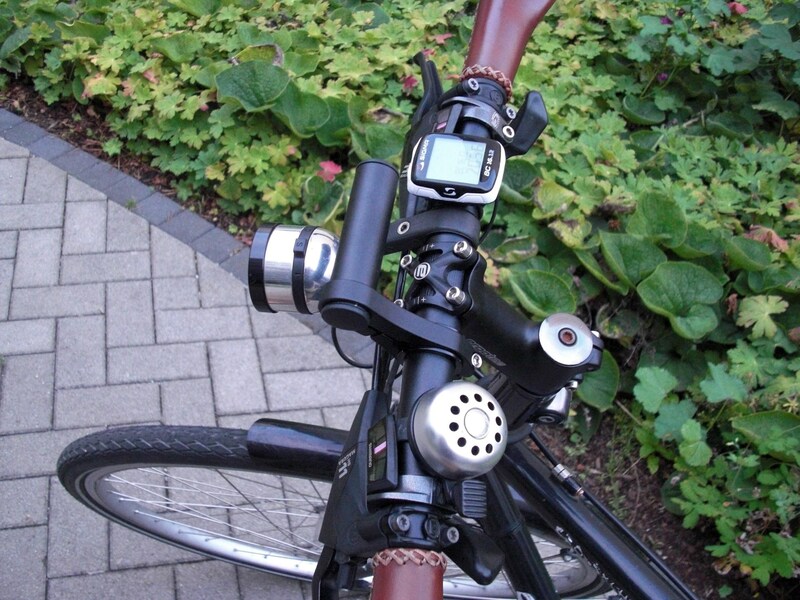 At the moment (as of July 2013) I use a 9-speed-cassette, a Shimano XT rear derailleur (RD-M751) and Shimano Deore “two-way release” shifters (SL-M590). The originally used Magura rim brakes sadly developed an annoying problem: The pistons tended not to retract completely. During winter the brake pads started to rub on the rims (even with the adjustment screws turned back completely). Since neither exchanging the oil nor any cleaning attempts helped permanently, I retired the Maguras and replaced them with V-brakes. The V-brakes work quite well with Kool Stop brake pads, don’t squeal, are very reliable and not much worse than the Maguras. 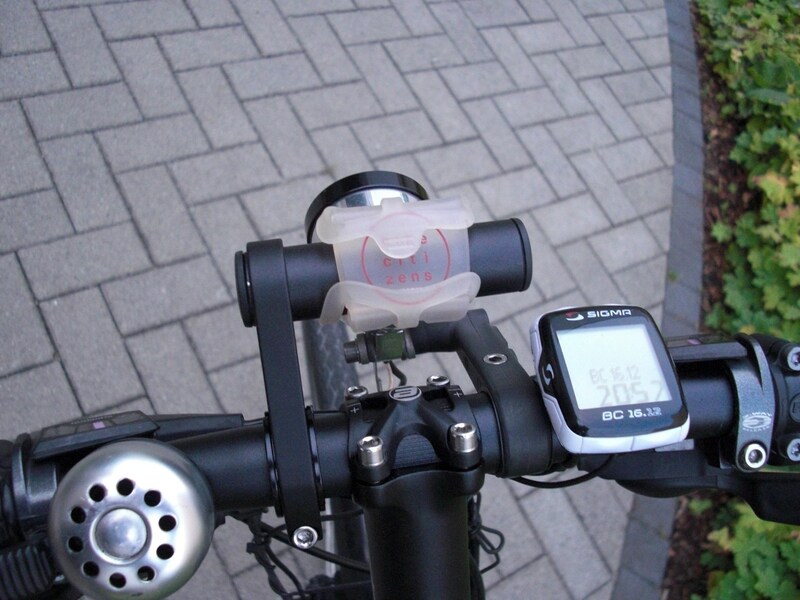 Since November 2012 a newer version of the Magura HS11 (including brake boosters) is being used again. 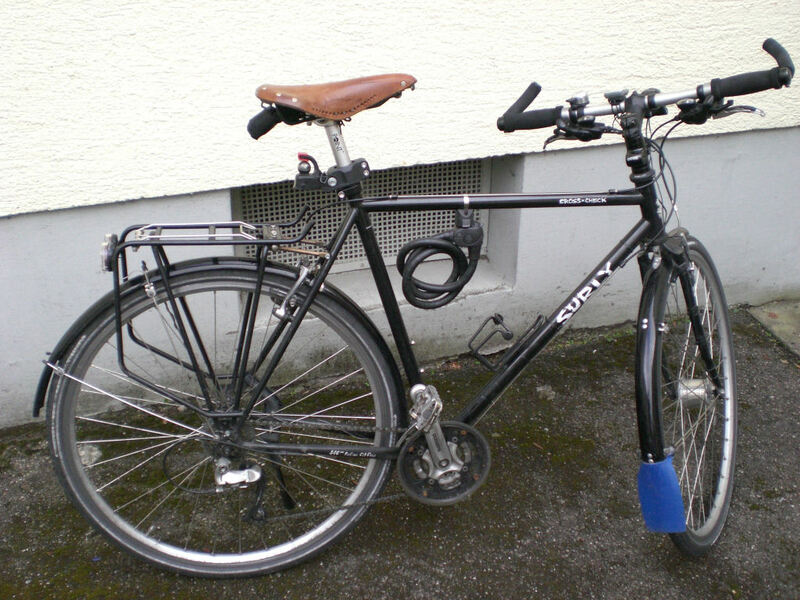 I have mounted the V-brakes onto my winter bicycle. 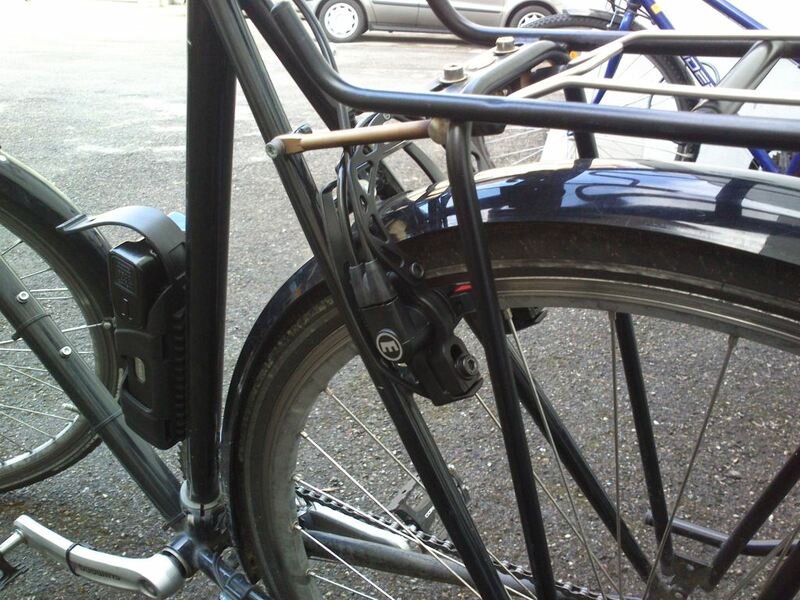 I already admired the advantages of a hub dynamo in my old bicycle. 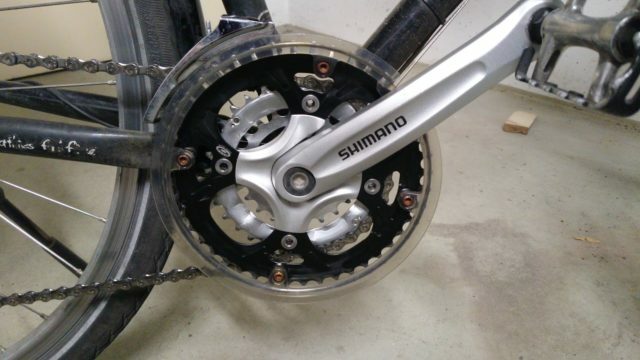 But the Shimano HB-NX32 turned out not to be fully suitable for daily use, since the bearings sometimes “freezed” during winter due to penetrated moisture and generally seemed not to be very durable (broad wear on the cones despite regular maintenance). Therefore, this part went to my second bicycle. 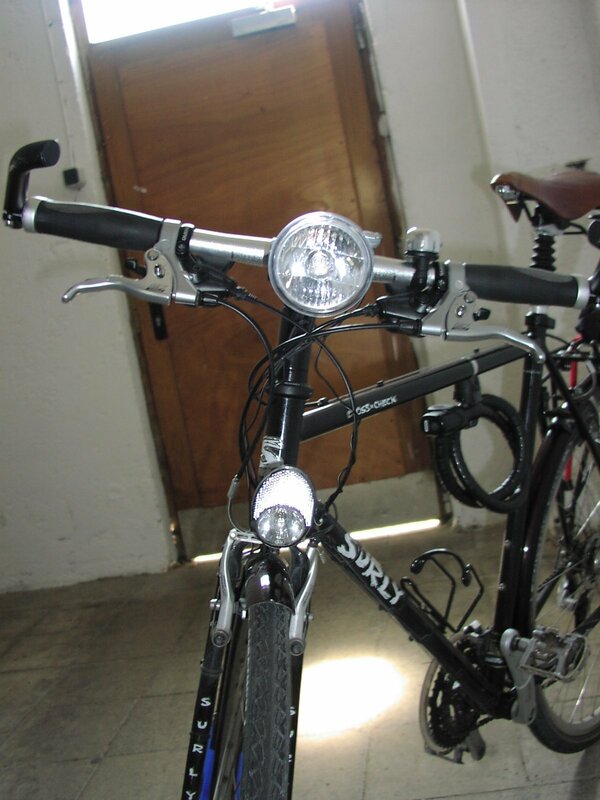 For the new bicycle I could afford a SON (Schmidt Original Nabendynamo) as well as a Schmidt E6Z as a switchable additional light besides the Lumotec Oval Senso Plus, which is mounted on the handlebar using the lamp support by Riese & Müller. 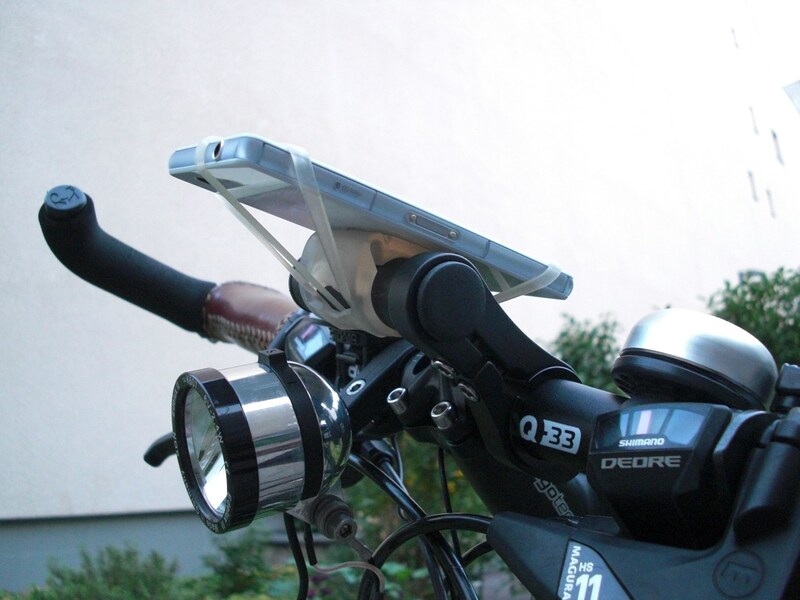 Meanwhile I use an “Edelux” by Schmidt – very small and very bright. 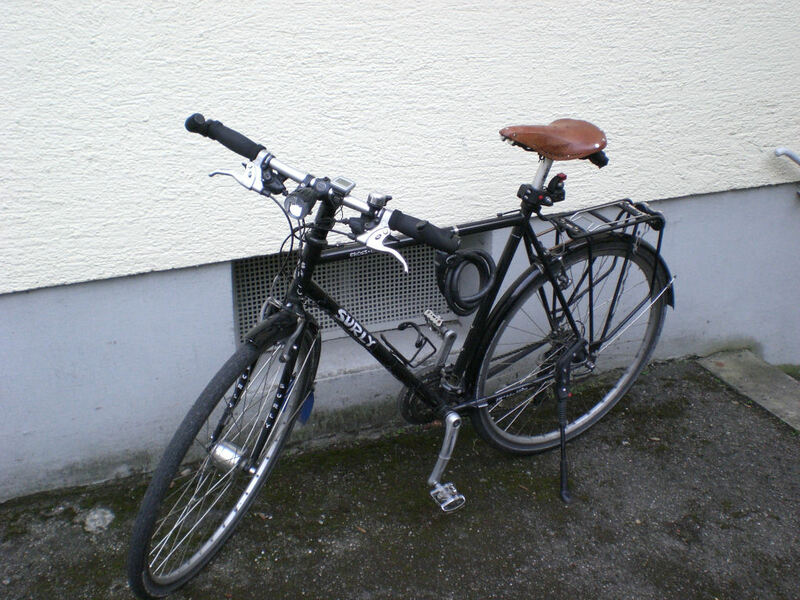 Alltogether the bicycle is potpourri of parts and also not a lightweight model – but it works quite good and is still very comfortable after more than twelve years regular use (as of January 2018) :-). 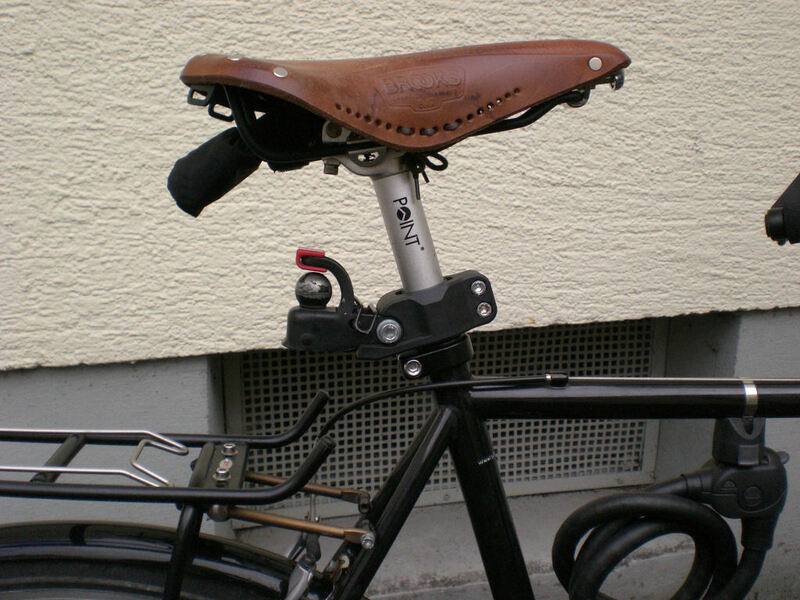 The suspension seatpost was soon replaced by a more simple, fixed seatpost, since the suspension started to develop an excessive play after a few thousand kilometers, even with linear ball bearings. In fact I don’t miss the suspension. If neccessary I just stand up if the way is a bit harsh. 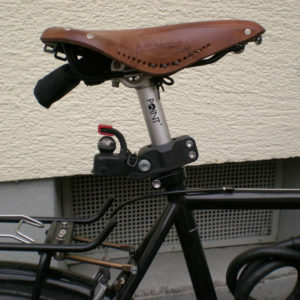 The saddle is (again) a Brooks leather saddle, also without suspension, but with pre-treated, softer leather and lacing to keep the shape. In march 2007 I finally dismissed the Ultegra rear hub. Generally it worked fine – but sometimes the freewheel body tended to produce a random cracking noise, sometimes it even slipped, when the pawls didn’t engage immediately. The chain was completely ok, also the sprockets. Since a new freewheel body also didn’t solve this problem I finally mounted a DT Swiss 340 road. Therefore the rear wheel only has 32 instead of 36 spokes, which might confuse the esthetic look (compared to the 36 spokes front wheel) – but one only can see this when examining at the wheel very faithful and the stability is completely sufficient. The DT Swiss has a bearing with two sealed grooved ball bearings and two other sealed bearings in the freewheel body – alltogether a very high grade workmanship and it also feels absolutely precise. The freewheel mechanism consist of two spring-loaded tooth wheels which works very reliable and is very simple to maintain – you can pull the complete freewheel including the mounted sprockets apart from the hub without any special tool. The ideal complement to the SON in front ;-). The random cracking noise from the rear wheel disappeared completely by all means. 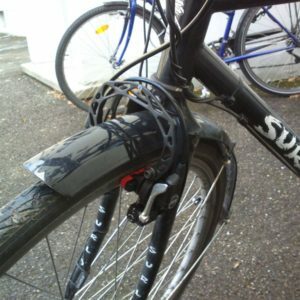 During winter 2008/2009 I used spike tires for a while (Continental Nordic Spike). I found, that the fenders with 42 mm where quite tight. Therefore I mounted wider finders with 53 mm and also choose wider tires for summer (42-522). The extension for the front fender is missing yet, but I think it will be mounted soon. A new chain was also neccessary and I noticed that the middle chainring was worn out heavily and had to be replaced as well. 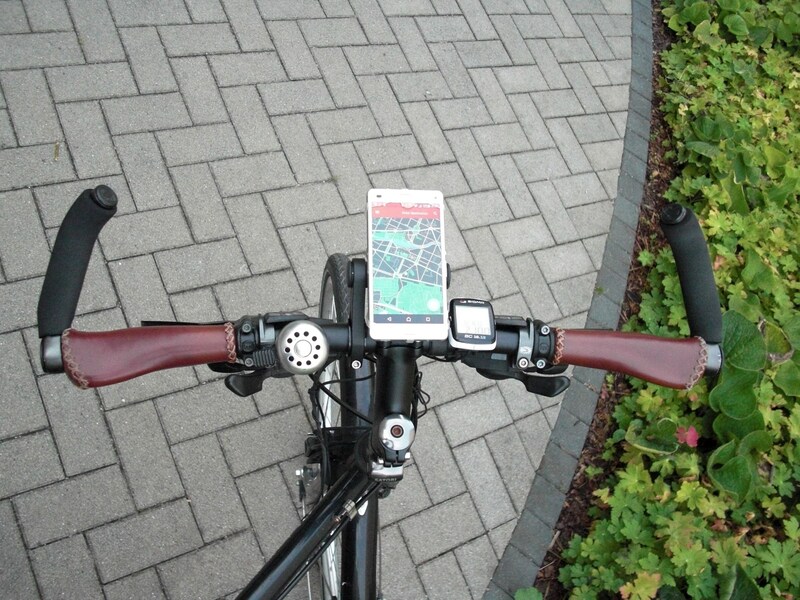 Unfortunately, the pedals became strongly rusty during the last winter and where replaced by PD-A530. 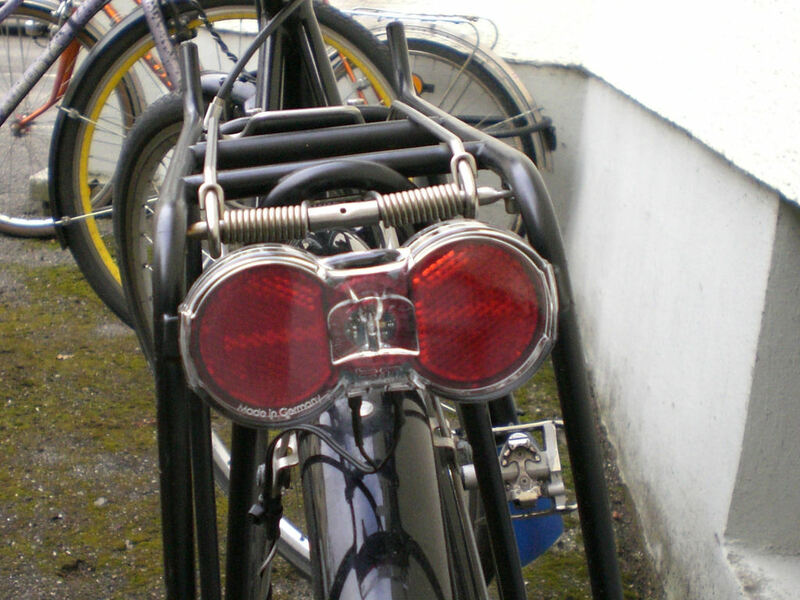 The tail light is now a “Toplight Line Plus” with an disengable sidelight. I couldn’t resist and replaced the Cyo with an “Edelux” by Schmidt. 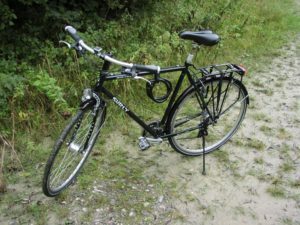 The PD-A530 which I have used for a while, unfortunately developed quite heavy rust and were not very secure when used in rain without cleats – therefore I decide to use (new) PD-M324 again. 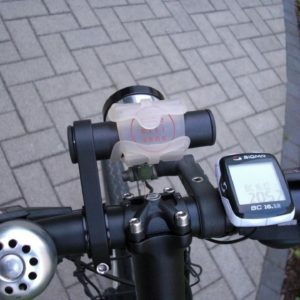 For the use during winter I got addtional pedals with a “biting” cage as well (Contec Trail) which I mount if neccessary. 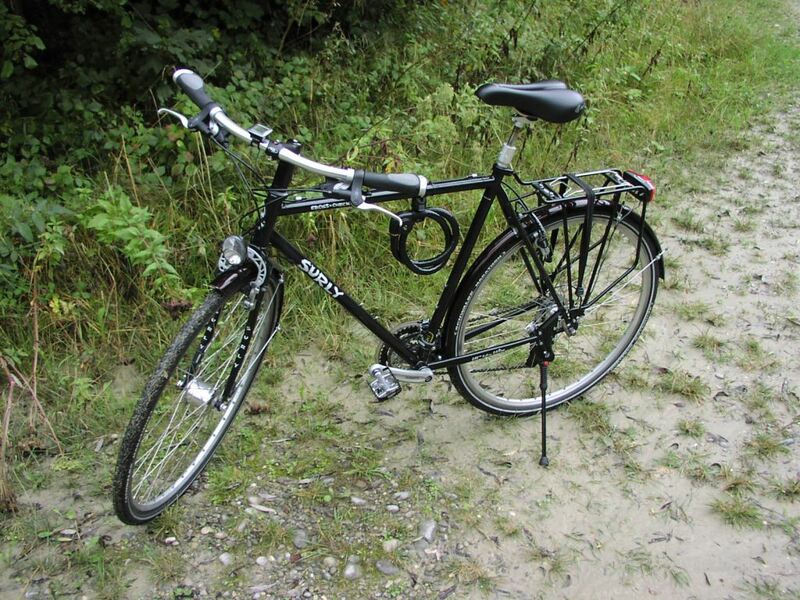 Besides that the bicycle still drives very well after more then 7 years – hub dynamo, rear hub, gears and brakes still work like new, even though used the whole year at every weather condition. 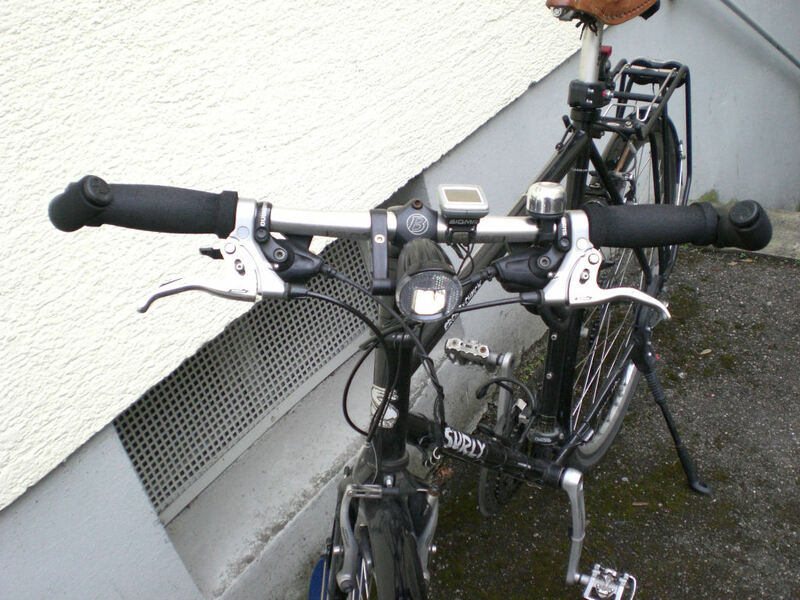 Motivated by the sales discount of a local bicycle dealer I converted the brakes to hydraulic rim brakes (again – Magura HS11) and 3×9 Deore shift levers SL-M590 (incl. a new 9 sprocket cassette HG61 with 11-32 teeth). 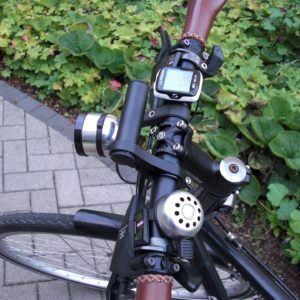 Mounting the Magura brakes using the “Evo 2” adapter was indeed quite easy – but brake boosters are still useful if you don’t have an extreme solid fork, since the brake cylinders otherwise bend a bit to the outside when pulling harder on the brake levers. The pressure point is also a bit “spongy” without brake boosters. 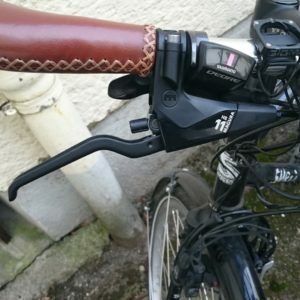 The new shift levers are a real improvement compared to the old ones – you need much less force on the thumb lever and gear shifts happen more precisely, even (or because of) with the narrower spacing of 9 compared to 8 gears. 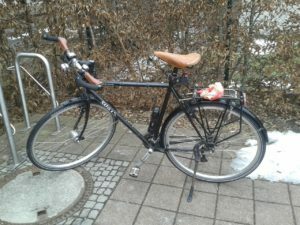 Only the position of the gear indicators on top of the handle bar are a bit inconvinient since this leaves less room for the bell – but in the end this was also resolvable. 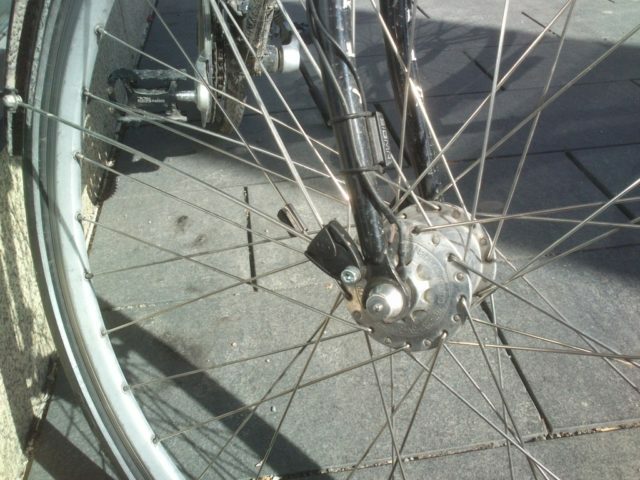 For many years the stays for the fender at the front wheel were mounted directly at the fork without any clip. 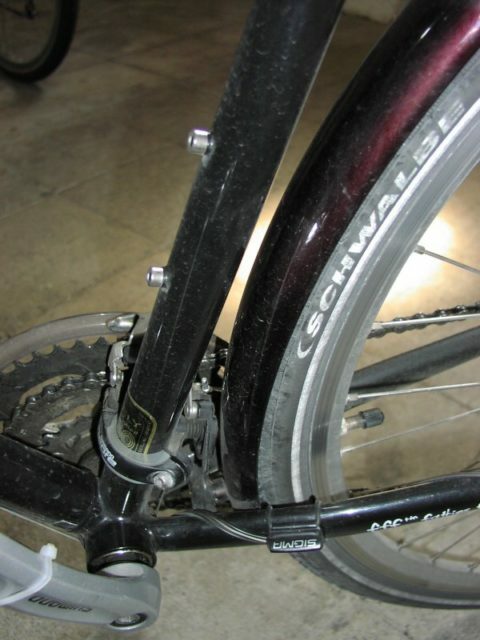 The problem: If any debris gets between the fender and the tire or into the spokes, this can lead to severe accidents when the fender is pulled up and the stays don’t release. Also see: article in “Tour” 12/1995 (German). Therefore I decided to change that before I will experience this kind of problem on my own (ouch!). The stays usually have to be shortend a bit which is no big deal when using a bolt cutter. The original screws with a length of about 10 mm were too short and had to be replaced with longer ones as well. 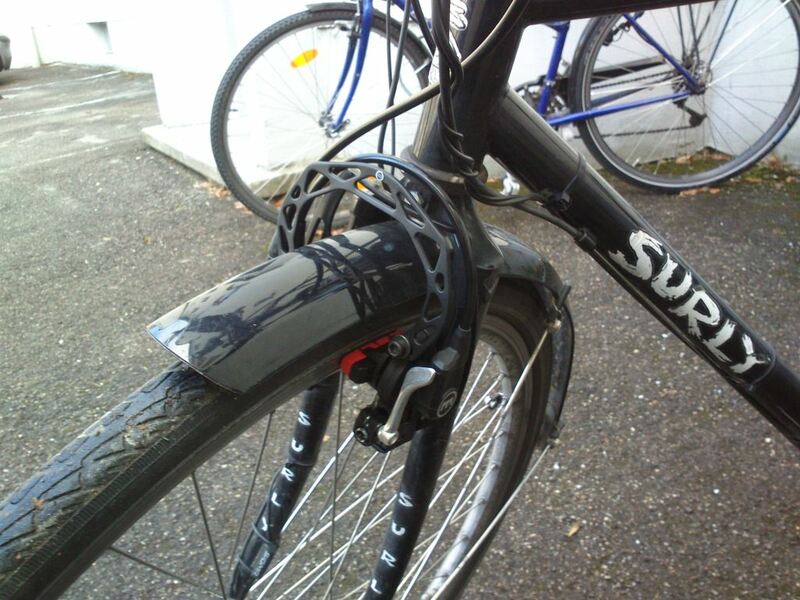 The advantage of “Secu-Clip” to the integrated plastic clips which SKS uses for some fenders regularly (for example “Bluemels”): This kind of fixation is much more rigid and the fender does not wiggle so much. This way the left part of the handle bar stays completely empty so I can put a camera there or an additional battery powered light if needed. 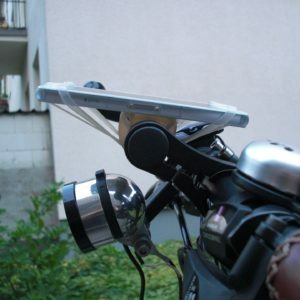 A piece of foam rubber beneath the zip ties provides a firm seat – so the mount doesn’t move even when strong vibrations occur. 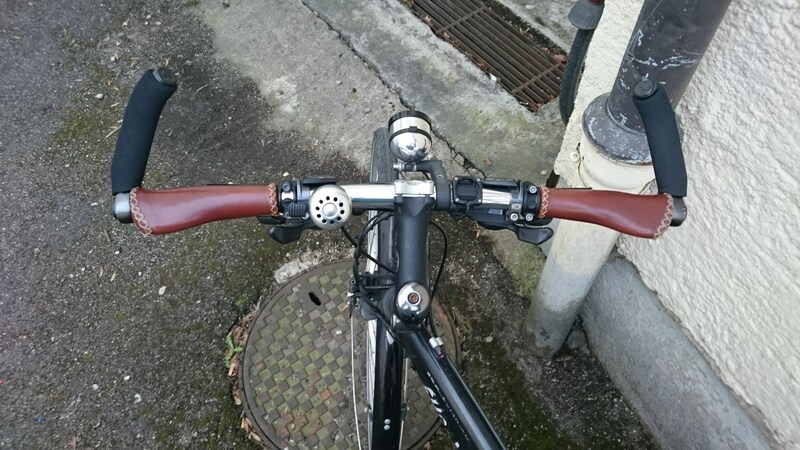 In the beginning I was sceptical if the longer stem will really fit – but in the end I have to admit, that this length is indeed much better. Since I have a dedicated winter bicycle now, the fenders where replaced by the narrower version which was originally mounted. These are a bit more rigid and provide more clearance to the tires, especially at the rear wheel. I also use narrower tires (37-622) again. 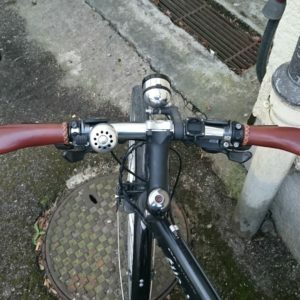 The more than 10 years old Kinex bottom bracket developed heavy rust on its surface and has been replaced by a Shimano BB-UN55 (also see “Rust soup in steel frame”). 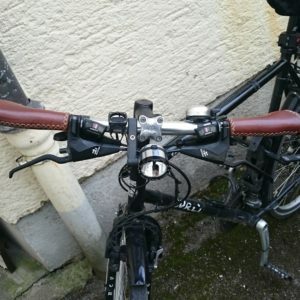 Since I sometimes got problems with aching hands on longer tours I mounted grips with “wings” – the model „Sturmvogel“ by Fuxon to be precise: The grips are a bit wider as the foam grips used before. Therefore I had to move the levers for the brakes and the shifters a bit closer to the center. After this there was not enough room for the bell which went to the left side. 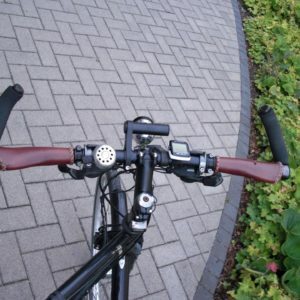 Time will show if the material will withstand the rough conditions of every-day-use (my bicycle is outdoor most of the time), but the workmanship and the feel is quite nice. 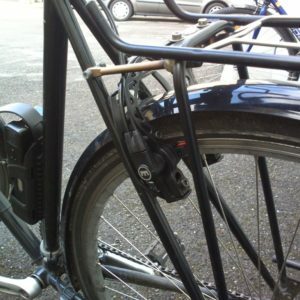 A clamp fixes the grips on the handlebar so they don’t get loose and rotate. The “winter pedals” (Contec Trail) had to be exchanged after about four years due to a failure of the bearings. 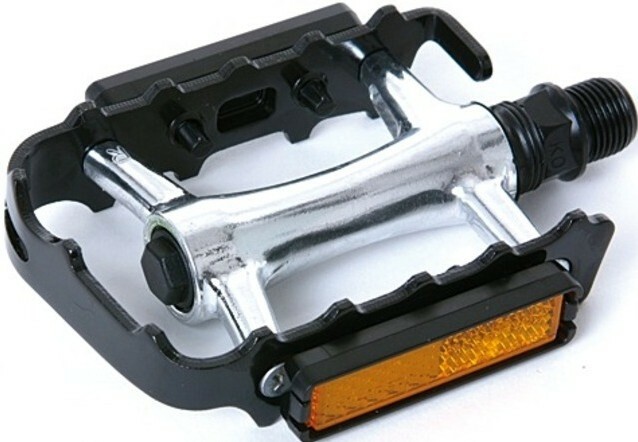 At the moment I use Contec CPI-046 – classic MTB pedals with sealed “industrial bearings” and the possibility to mount toe clips. The bearings are likely friction bearings, but at least the sealing with a rubber sleeve at one end of the achsle and a screwed in cover at the other end looks fairly reliable. 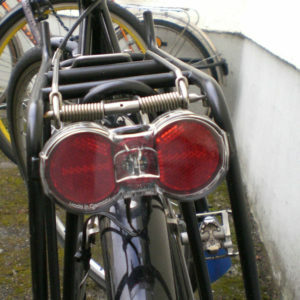 The reflectors which were poled on the pedals were removed as they wouldn’t last very long anyway. After many years I mounted new rims and now use “Andra 30” by Ryde (formerly Rigida) which are quite robust and provide wide side walls without groove as wear indicator. More about this also with picture see my other post. 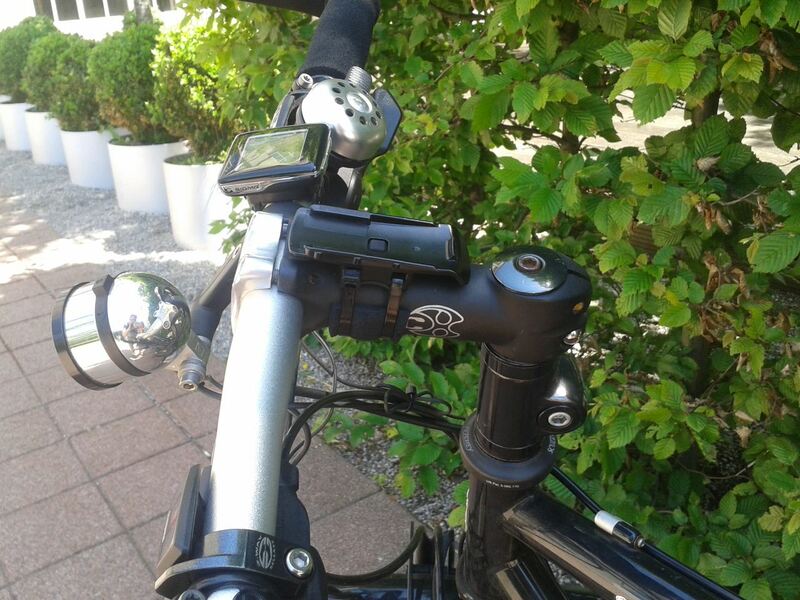 Unfortunately the Edelux developed a strange problem after about four years: when driving slowly the light started flickering much more as usual and sometimes got brighter at irregular intervals. 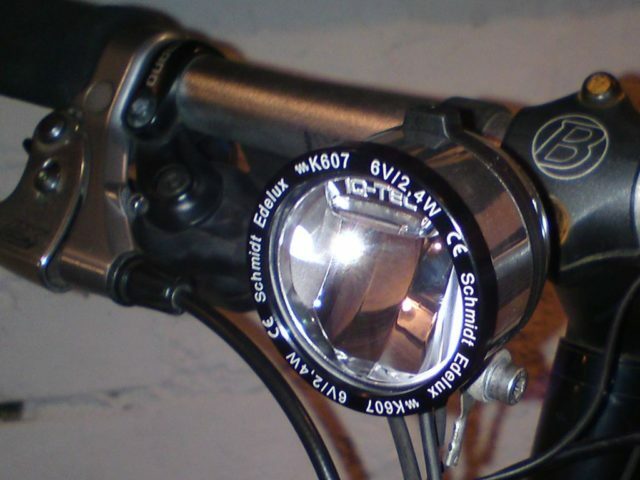 The shop where I purchased the Edelux originally also had a look and changed it to a current Edelux II which uses the “IQ-Tec P” reflector by BUMM a slightly stronger LED. 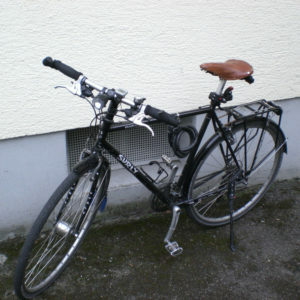 Therefore the illumnated area in front of the bicycle got much wider. Another improvement is the sealing of the glas cover which now uses two O-seals instead of one. 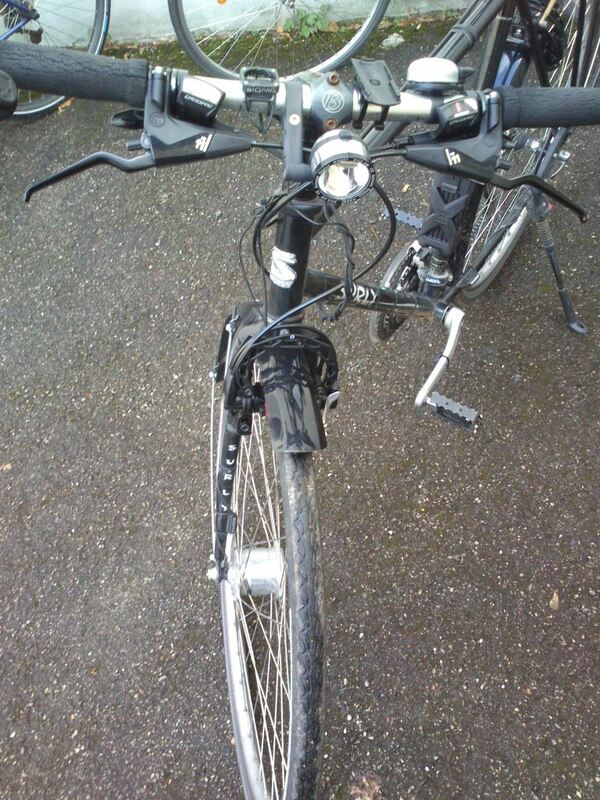 Due to an accident the handle bar and the right brake lever had to be replaced. 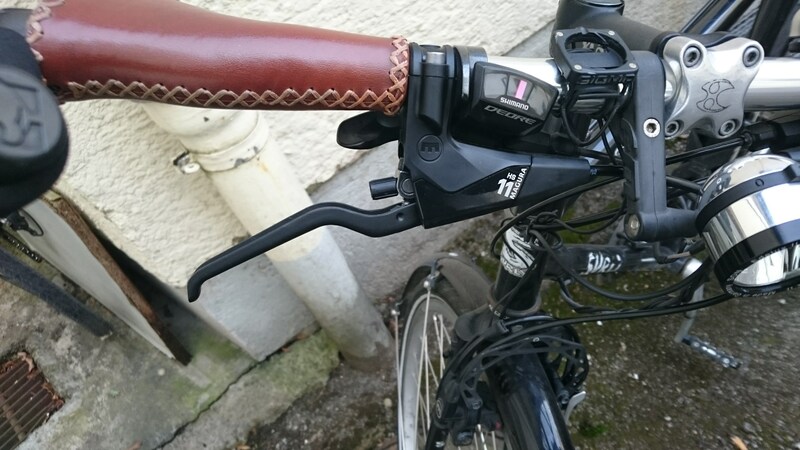 The new handle bar is now a bit taller with 580 mm compared to the old one with 600 mm. However all parts still fit and I even find this a bit more comfortable. 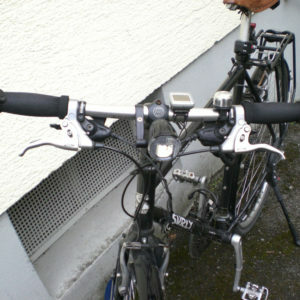 Magura changed the appearance of the brake levers for the current version a bit. But this does not bother me as the brake still works flawless and the old covers fit as well. 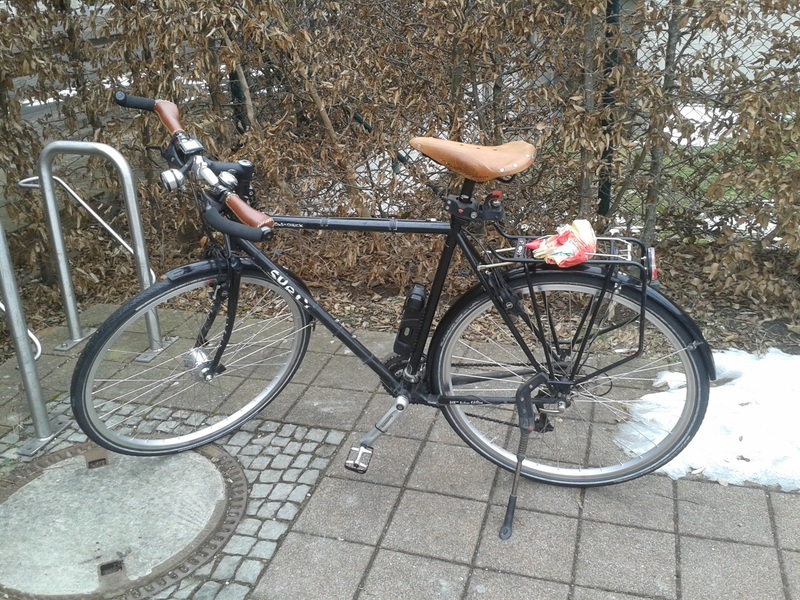 In Berlin my saddle was stolen :-(. 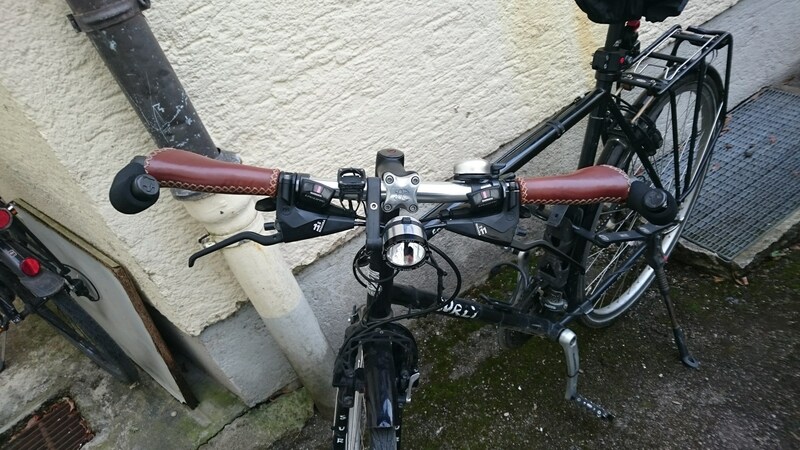 As a replacement I mounted a model by Terry which is at least also quite comfortable and in contrast to the Brooks also weather resistant. For the urban traffic in the city I also find a less stretched position more comfortable. Therefore I mounted a shorter and higher stem again. 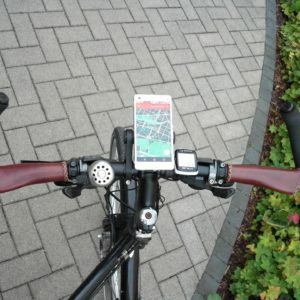 Additionally there is a “Space-Bar” by Mounty for my smartphone since I like to use the navigation for some of my routes in Berlin. 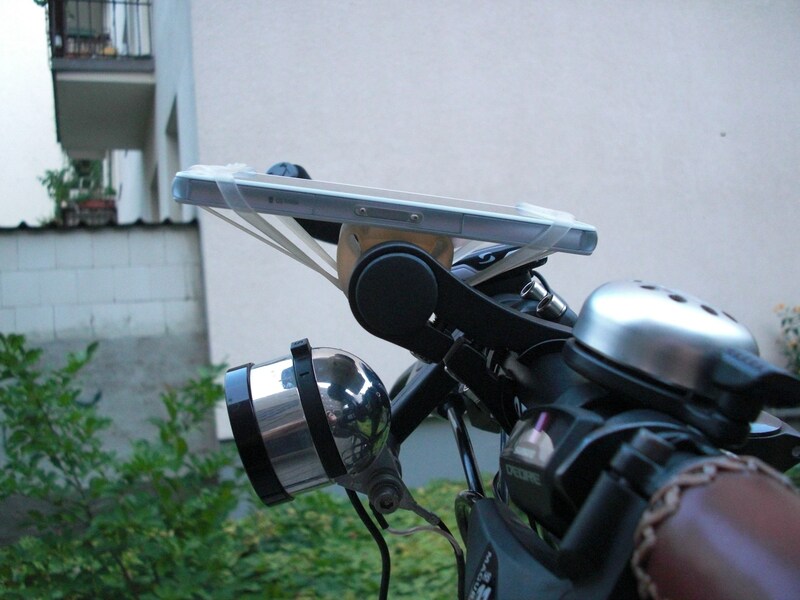 The silicon mount by the way is the model “Finn” by Bike Citizens which may look flimsy but proved to be very reliable in practical use. 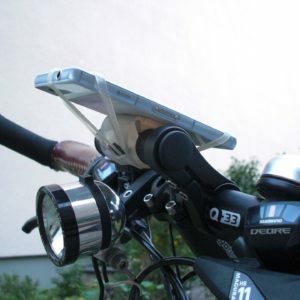 Even on bumpy cobblestone the smartphone stays secure on its place. During the regular maintenance I replaced the cassette and the chain. 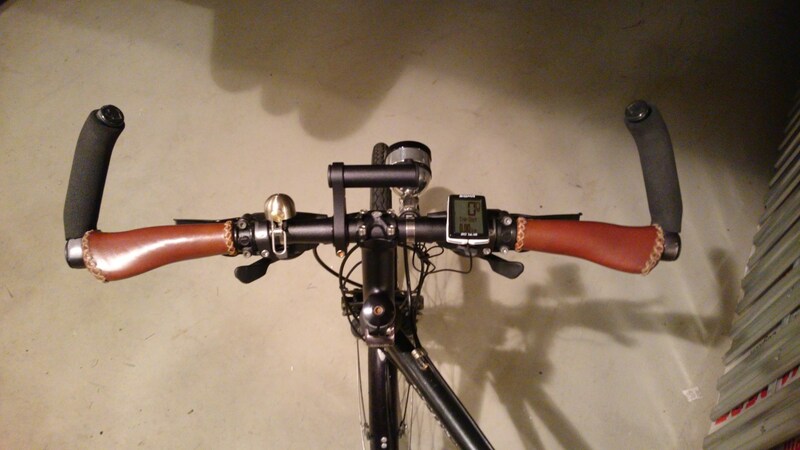 Additionally I also exchanged the Deore shifting levers by SLX without gear indicator, so there is enough room now for the excellent bell by Spurcycle and I also could mount the bike computer (a Sigma BC1416 now) near to the right handle. The new chain has also shown that the middle chainring was heavily worn, so I also replaced it. On the occasion I also mounted narrower tires (32-622) (the picture below shows the wider tires before I mounted the narrower ones). I also cleaned the crank – it had not been that clean probably for 10 more years. Only the screws for the chain guard are a little bit rusty, which does not bother me.